Most of the teams in the Ivorian Ligue 1 2012 have currently played three or four matches. In this post, I will publish my list of scorers so far this season. Interestingly, my personal list is different from the “official” list published at http://www.fif-ci.com. 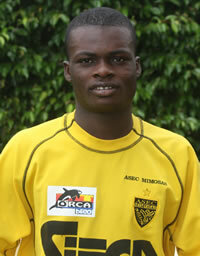 The picture is of promising striker Jean-Jacques Bougouhi (born 12.06.1992) and is taken from leballonrond.fr.